Nigma walckenaeri has been found in gardens or parks in the London and south Essex area, with some records further north, but has also been found more recently in similar situations in the Severn valley. 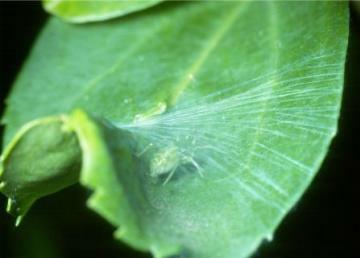 Any small green spider found hiding underneath a web spun across the top of a leaf in the late summer/ autumn period is quite likely to be this spider. Favoured leaves include those shrubs or plants with reasonably sized leaves that have a concave surface such as lilac, ivy, holly, Forsythia, Magnolia, etc. However other green or greenish-yellow spiders occur in summer (see pictures opposite), such as the small orb web spider Araniella (several very similar species and very variable as adults and juveniles), Enoplognatha latimana and Enoplognatha ovata which comes in several colour forms including one without red band/s. These spiders should not be confused with N. walckenaeri, which is not adult until late summer or autumn.